USB flash drives are common and very handy for quick data transfer. You can easily plug them to USB port and copy required files. However, at times we forget to unplug / remove USB flash drive from computer even after data transfer is complete. FlashRecall program should be useful in such scenario. It is a free flashdrive reminder utility. If USB flash drive is still plugged and you are going to shutdown or log-off from the computer, this program will pop reminder screen to unplug drive before the actual shutdown or log-off routine. Besides the reminder screen, it will also play beep sound with the motherboard-speaker (if available). 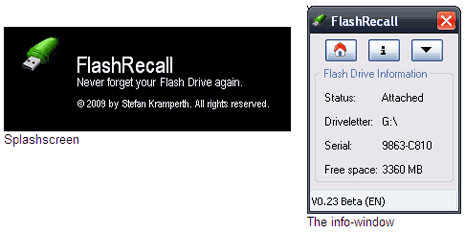 Download FlashRecall and never forget to unplug USB Flash drive. Easy, simple & useful! When you log off/shutdown, Windows will force programs to close so all that this app does is show you the warning message for about 2 secs before Windows shows a ‘Close Program’ box which asks to ‘End Now’ or ‘Cancel’ – when you do either, the system shuts down/logs off – and if you forgotten to take your USB drive out by now, you’ll leave it behind!! !